Choose Deck Doctors! The Virginia Beach Deck Builder of choice! For high quality custom deck building, Deck Doctors are here to help. 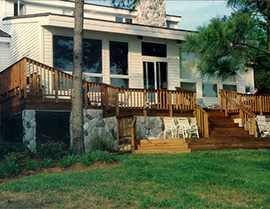 We’ve been building beautiful decks for Virginia Beach residents for many years. Virginia Beach, VA is a beautiful city with a population of approximately 448,480. It is included in the Hampton Roads metropolitan area, also known as “America’s First Region.” This is where the oldest surviving colonial home in Virginia is located, the Adam Thoroughgood House. Virginia Beach is rich with history; in fact, a total of 18 sites on the National Register of Historic Places can be found here. Much of their economy is produced by tourism because there are miles of breath-taking beaches, hotels and restaurants. The Virginia Aquarium & Marine Center is popular attraction that offers hands-on ocean exploration exhibits and, occasionally, whale sightings. The Virginia Beach Ampitheater is where many of today’s popular vocal artists, including Taylor Swift, perform. With over 200 parks, the Virginia Beach park system is recognized as one of the best in the United States, according to The Trust for Public Land. This is also a great location for athletes because each year, the city hosts a Rock ’n’ Roll Half Marathon over Labor Day weekend; one of the largest half marathons in the world! It is also where the North America’s oldest surfing contest takes place; where more than 100 of the world’s top surfers compete for the grand prize. 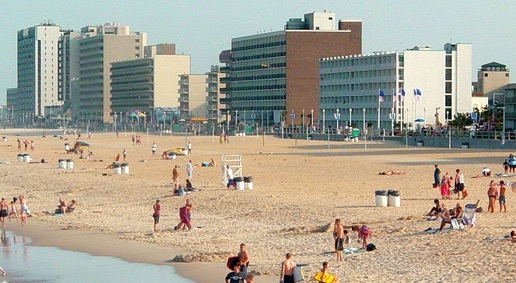 Virginia Beach is the perfect location that has much to offer to both residents and visitors! We had a recent deck installation for a Virginia Beach customer. The Deck Doctors set up a consultation with the homeowner, so we could find out exactly what type of deck layout she was interested in. Our designers arrived at the home and discussed the process, layout and materials for the project. 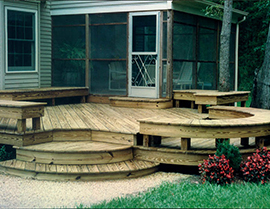 She wanted a deck that would be very little maintenance, was functional, and was affordable. We went over a variety of options with her that would meet her needs. Before we began installing the piers, it is important to know the depth of the frost line. Sinking the support posts to the frost line will keep it from buckling when the ground expands from freeze/thaw cycles. This deck was going to attach to the back of the home. 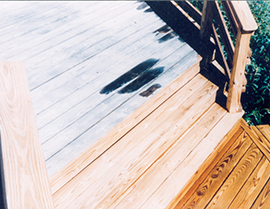 The deck boards that we used were made from traditional cedar and the posts were pressure-washed to prevent decay. We installed the piers and anchored the posts on top, then began laying the wood planks. This deck was only going to need a few steps, not an entire staircase. After a few days, we had the deck completed. 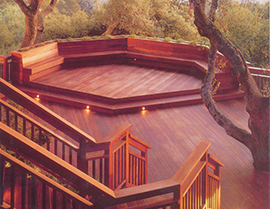 We offer our customers with many options for deck installations, which include eco-friendly products and materials. If you would like to have a deck installed at your home, then give the Deck Doctors a call today. We offer free consultations for all of our customers. 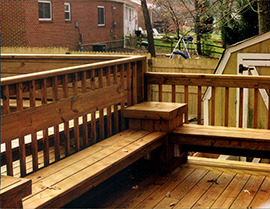 The Deck Doctors are the deck experts in Virginia Beach, Virginia. We look forward to hearing from you.